The final sentence of yesterday’s statement from Bradford City summed it up perfectly. After weeks of rumours and uncertainty reached fever pitch on Sunday, the club has firmly stated its position via a joint statement issued by Stefan Rupp, Edin Rahic, Stuart McCall, Greg Abbott and James Mason. McCall will continue as manager. Rahic and Rupp continue to support him. The band is back. Clearly there was something in all of those rumours. Arguments took place behind the scenes. But the disjointed nature of the early parts of the close season probably helped to exaggerate the situation. With McCall, Abbott and Mason holidaying in different parts of the world last week, getting everyone in a room together to clear the air has taken time. In its absence, those rumours were given the oxygen to spread. Whilst the content of those crunch talks will only be known to those in the room, WOAP understands there were two key starting points. Firstly, McCall had no intention to resign or walk away from the job. Secondly, Rahic and Rupp did not want to lose his services. This made it easier to reach the compromises and common ground that now allow everyone to move forwards. We should never underestimate or devalue just what this club means to Stuart McCall. His 37-year association with Bradford City underlines shows how much he cares about its fortunes. He is deeply proud to lead the club. Those rumours that he might leave for Leeds or Aberdeen simply didn’t make any sense when it comes to his loyalties. He wants to lead this club forwards, and deliver success. In the build up to the Millwall play off final McCall stated winning the game would be the proudest moment of his career. A massive statement for someone who experienced so much personal success. Rahic and Rupp did not expect McCall to achieve what he did last season. A push for promotion was hoped for but not demanded. In the pressure cooker of the run-in, where every game mattered and the top two remained a vague possibility, it’s understandable if that was forgotten. City had a massive chance to get into the Championship, and it was a crushing disappointment not to make it. But now everyone has had the time to sit back and reflect, it’s clear 2016/17 was a very good season for Bradford City. Certain moments could have gone better, but they shouldn’t detract from the overall achievement. 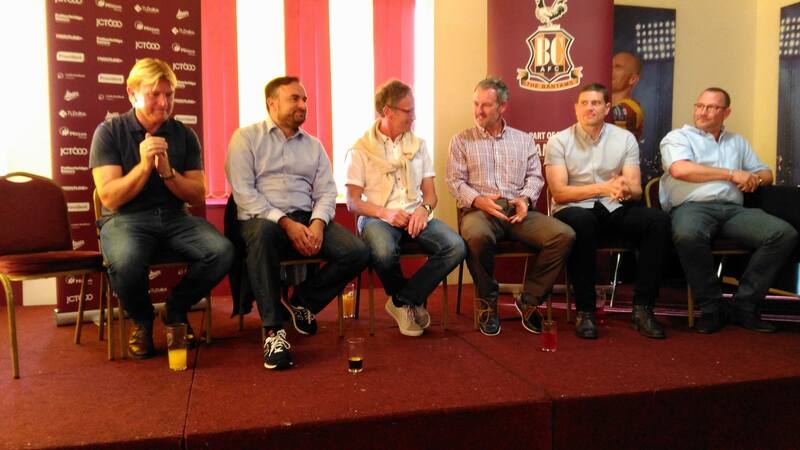 It is difficult for everyone – from manager to supporter – to see key players depart Valley Parade this summer. But that doesn’t mean the club is secretly skint, and can’t compete for wages with other League One clubs. Every player has his value, and the likes of Scunthorpe have seemingly offered deals that exceed that. It can feel daunting to rebuild so much of the team. But if that’s the reality, everyone just needs to get on with it. The hope is that the transfer targets identified by Greg Abbott are as good level of quality as the people leaving the building, and time will tell. At the moment we are left judging incomplete pictures, but the successful resolution of these talks should give every supporter confidence. In 2014 Stuart McCall had just achieved a third successive top three finish with Motherwell, only to have his budget cut yet again. He lost good players, Motherwell struggled badly the next season and McCall quit. A sour end to a period where he had reached cup finals and achieved Champions League football. City might be his dream job but I doubt he fancied a repeat of that this time around. The budget – boosted by transfer windfalls around Nahki Wells and Andre Wisdom – can and must be competitive. Let’s now see how wisely it is spent. Rahic and Rupp have received some very strong criticism over the last few days. There seemed to be an expectation from some supporters that the pair were going to spend huge amounts of money, despite them stating from day one this would not be the case. They do have deeper pockets than Mark Lawn and Julian Rhodes, but they’re not Roman Abramovich. Equally important is their repeated stance on building up the club and being here for the long-term. We all want success now, but the owners are committed to doing things in what they believe are the right way. So the focus now firmly turns to next season. New arrivals will inevitably take their place in the dressing room, pre-season training and friendlies are still a few weeks away. Although McArdle’s departure seems inevitable and Bolton continue to be linked with Tony McMahon, there should still be hope of keeping Mark Marshall. So far it has been very quiet on the transfer speculation front for the club’s player of the season, and we know how much he enjoys playing for McCall. That could be the key deciding factor. This strange close season will hopefully be quickly forgotten, but that’s down to everyone at the club to deliver. The transfer committee need to bring in players who meet McCall’s approval so they can be signed, and McCall needs to make sure the pain of last season’s play off final defeat is channelled in the right direction so the club bounces back. There’s a big season ahead, but when is that not the case? “We’re now ready to go again” said the statement. This needs to include each and every supporter. It’s time to move on and look forwards. Totally agree with everything you wrote in the article which is similar to what I posted in previous threads. We can compete with wages but we wont pay over the odds, to me that’s great and how we should be run. We need to wait and see who comes in and what we get before all the doom mongers start even though they have started earlier than usual this season. I trust our chairman and believe in what they are doing and with James Mason, McCall and Abbo our club is in great hands so just enjoy the summer and wait for the new players to arrive. Its always diificult when a team paying middle income wages fail at the last hurdle and there are a number of out of contract players. It was going to be a wait and see senario until the outcome of the Wembley final was known. However, it has become clear that Mccall wanted to keep the bulk of the players that came so close to promotion. It is also becoming apparant that this is not a view shared by the chairmen and there has been an undercurrent of disharmoney and lack of communication to the fans about the tenuious situation for a few weeks. Hence the club releasing a statement at 8pm yesterday to clear up the situation. Theres no smoke without fire hence a statement hastley prepared and realeased at 8pm? Communication between the board, Stuart his staff and the fans is simply not good enough and leaves the owners open to critisim. Given the growth of social media fans have forum to voice their discontent and demand answers. It appears that the offers on the table for out of contract players are competetive but can be bettered by bigger budget clubs and higher level teams. Hence you always run the risk of losing your better players after a sucessful season although it ultimately ended in disappointment. The charmen have a vision and philosohpy to bring in younger players however, our best players this season have been the senior pros such as Marshall, Vincelot, McCardle, Meredith and McMahon. If players of this calibre are allowed to be moved on exactly what will be the ages and experience of the replacements? Younger? Much younger? Or the same age as the experienced pros leaving? There has to be a balance between youth and experience and given the extra income generated this season from sell ons, play off income and player sale why not offer a more competetive salary to keep experienced players in their prime that are out of contract? It appears that youth will be given the opportunity over experience as it makes no sense to let these players go and replace them with like for like players of a similar age. No sense at all. The sale of Clarke is good business but he will do well at Charlton if played in the right position and he stays injury free. Its a big pull for a player to get 1 last pay day in the prime of his career and move to London el a Clarke and Meredith. Thus far i have been underwhemed by the take over of the club and it appears the Germans are trying to take the club forward on the cheap. If this is the case why buy the club in the first place? It appears relations are strained and there is plenty of work to done on and off the field if the club is to built on last seasons failures and sucesses. Totally dis-agree with this post. If our owners are doing this on the cheap why buy 3 players for a combined total of nearly 350k. We received around 200k for Hanson (if we were doing it on the cheap the owners would have kept the money and got a loan in) which paid most of Wykes fee but the owners put in 50k of their own money plus around 80k for Vincelot and around 30k for Jones. If that is doing it on the cheap you are very much mistaken. Why are you panicking I don’t understand supporters like you? If you want the board to spend ALL our budget on 2 or 3 players you are supporting the wrong club and if we did do that we would very quickly go back to administration again. Why do people want everything now? Things take time and these are exciting times. Meredith and Marshall will be big losses but we can replace them with the money we now have. An outlay for 80k for Vincelot. Pre season. An outlay for 250k for Wyke in January transfer window exactly what we sold Hanson for with a small sell on for Guiseley. 30k for Jones was off set with the returning Vuckic & the forward from Sheffield united in wages also. Its break even. Vincelot and Gilead outlay has been recooped by play off sucess 300k plus. The owners gambled the small short fall knowing that we could recoop at wembley and by selling 2k more season tickets than last season. 2 months early to boot than last season. All money in the bank. The outlay has been nominal. McCardle has been a stalwart for the club and scored the goal to take us to wembley. Fans are are allowed to question why we are not competing with clubs on the same level in keeping experienced pros and why the club are releasing statements at 8pm in relation to Mccalls position at the club. So are you saying you would like us to spend most of our budget on McArdle? I loved him as a player but I wouldn’t want us to spend most of our budget on him certainly not at 30/31 years of age. As our chairman have rightly said we will be competitive with wages for players who are coming in so why like Scunthorpe should we throw silly money at players when we don’t need to? Andy R. Dude. What’s this fixation with 8pm? Did you miss Corrie or summat?! Social media is by its nature 24/7 and the timing of the statement suggest to me that we have people at the club, during their summer break no less, who are prepared to work well into the evening away from their families, just to respond to supporter’s demanding information. If you think that’s typical, look around some of the other football clubs in this country! I truly don’t see the problem. Let’s all grab a few days in the sunshine with a cold beer and look forward to August shall we?! Andy R – you appear to have completely forgot the last 15 years when this club has gone through 2 administrations and dropped to the bottom of the FL. I would never want to go through all of that again thanks to what was described as ‘six weeks of madness’. Our owners have never promised to spend £millions on the club. What they’ve made clear from day 1 is that club will be run on a sound, prudent (solvent) basis. They’ve invested their own money. But more importantly for me, they’re not gambling everything on a make or break season. Nor are they ‘asset stripping’ as some fans have accused them of on social media. The club has been making investment in the ground – dressing rooms overhauled, big screen, pitch relayed (twice), new seats in the main stand and the club offices renovated. Whilst some of these have been payed by supporters crowd funding, the rest has had to funded from somewhere. Next season we’ll have the ‘old’ Campbells bar back open again for us to quench our thirst – all thanks to the club. The owners have a stated aim of reducing the overall age of the team. Some how people have taken that to read we’ll fill the team with wet-behind-the-ears 16 – 18 year olds. Yet, one of their key signings was Wyke, who at 24 has cut his teeth in the game at Carlisle. He’s still learning and has the potential to go further with the club or elsewhere before his career ends. Interestingly, McCall explained a few weeks ago that Wyke was one of the targets lined up for this summer, but the unexpected sale of Hanson meant that was brought forward. This suggest to me that the club have had players on their radar for sometime and if they are meet the same criteria as Wyke (early to mid twenties, first team experience, still maturing) then we can look forward to some exciting football next season. That small sell on to Guiseley that you describe was in fact 25%. So the Hanson money was nowhere near enough for Wyke. Releasing Vuckic and McNulty would not cover the 30K for Jones as they would still need wages for Jones,not to mention the 20K for Jacob Hanson and the 50K for Vincelot, so no way have they broken even as you state. Had the previous board been in charge last season I am sure James Hanson would still have been sold but there would have been no Jones or Wyke but probably just the return of Procter for the rest of the season. There are saving on hansons wages compared to wykes wages and savings on vuckic and mcnulty to allow jones to come in. 2k more season tickets sold by april than last year. Money up front. The situation is know where near comparable to paying 40k per week in the premier league for carbone and the 6 weeks of madness. If you want to keep your better players who help sell sesaon tickets, give year on year improvement, drive the club forward and take you to the play off final then you have to match the wages your rivals are prepared to pay for their services whilst keeping within a wage structure.its a balancing act. If the owners dont want to match wages then replacements will have to be brought in. If theyre at the level of Meredith and Mccardle only time will tell. However, thats the owners call. To put out a 8pm club statement stating that mccall will be manager next season says to me there have been major disagreements about how to go about offering new contracts to existing players. I firmly believe Mccall wants to keep the bulk of the squad together but stated he doubted this whether that be because there are teams prepared to pay better wages than we want to pay is open for debate. Anyone who has listened to mccalls last few post game interviews must have detected problems within the club. Only time will tell how the club move forward and what type of player will be brought in in the summer. I believe the club put out the statement when it did due to the hyperbole around McCalls future. The Carbone situation is exactly the same as now. We couldn’t afford his wages then as much as we can’t afford to match the Charlton, Bury and Scunnies of this world now. Paying over the top wages crippled us for years. If we did the same again now (no matter how good a player is) could lead to exactly the same situation. The only diffetence between then and now is the size of the wages. Retaining McCall- hallelujah with bells on. I’d be happier if we’d held all the out of contract players, and worried about the silence after the end of January. But its apparent that the championship level players like Meredith wouldn’t have committed- and I guess i can understand the calculated decision not to sign all of them when unclear what league we’d play in. I’m also willing to be patient, and support our owners. I’m also avoiding the total speculation and negativity of most of the social media. Stuart McCall says he doesn’t read it. Wise man. I just really hope, that, behind close doors, owner and manager can build a good working relationship, with mutual respect. What did most genuine city fans want 2 days ago!???? Can we now have some calm before the real storm starts, when the new season actually kicks off! We are all passionate about OUR club. Go out, place your order for the new shirt and wear it with a smile on your face but above all with . Ha Ha exactly. The season hasn’t been finished a month yet and people are panicking. If you wish to worry about supporting a struggling football club, go and support Billy Clarke’s new employers. A close friend of mine who has been supporting Charlton Athletic for over 30 years, only attended two home games at The Valley last season and one of those was against us as we met up. They did this out of protest against the Belgium owners of Charlton Athletic. There’s a real storm brewing down in SE7.